My Heartache Cowboy picks up with Jimmy and Eddie right where they left off in My Cowboy Heart. Belligerent and angry at the world, Jimmy drank until he passed out only to wake up alone in a parking lot, sitting in Eddie’s truck with no memory of how he got there. Eddie soon joins him but, confused by his blackout and trying to deal with his own feelings after finding out his best friend is gay, Jim quickly grows angry and defensive. When Eddie comes clean and tells Jimmy he’s taking him to a remote cabin and forcing him to confront alcohol abuse things really explode. When things become too much for Eddie to handle and Jim’s life itself is at stake, Eddie turns to his longtime casual lover for help. Together they provide a cold dose of reality, encouragement and a little sexual healing that goes a long way in helping Jimmy overcome his addiction. But in the end, Jimmy is a grown cowboy and makes his own decision. Whether they’ll cost him the man he loves or not, you’ll just have to pick up your own copy and find out! Although I won’t tell you how it ends, I will give you a little more information! First off, when I think of author Z.A. Maxfield’s work I keep coming back to the same phrase: real life. Her stories are not perfect, her characters are not flawless and her relationships are not typical. They are real and they’re full of life, the good and the bad. Jimmy says hateful things, eats fatty foods without a care and makes some really bad choices. He’s real. Maxfield did an excellent job of breathing life into My Heartache Cowboy. A big part of the story dealt with addiction and alcoholism and I thought the author did an amazing job of giving the reader a sense of understanding and empathy for what Jimmy was going through. The internal dialogue really made me feel the desperation and feelings of hopelessness that ate at Jimmy. I wanted to hug him and I wanted to tell him I understand. And when Jimmy started figuring things out and coming to his own conclusions, again the reader was right there with him, sharing in his faith and finding peace with him. The author perfectly balanced this story on the edge without letting it fall into depressing or boring. Another huge part of this story is the ménage relationship between Jimmy, Eddie and Don, a doctor with a cowboy fetish and Eddie’s frequent lover. I have to be honest and say that for the first half of this book I really felt like Eddie’s relationship and intimacy with Don would be a huge obstacle for me. I have no problem with open relationships or multiple partners when I feel the love and connection is shared amongst everyone. But again, Maxfield brings you right to the edge. Just as I was feeling like Jimmy and Eddie would never really connect or share a special bond the author proves just how good she is at her craft by fusing a love between them that is different and stronger than the relationship they both share with Don. 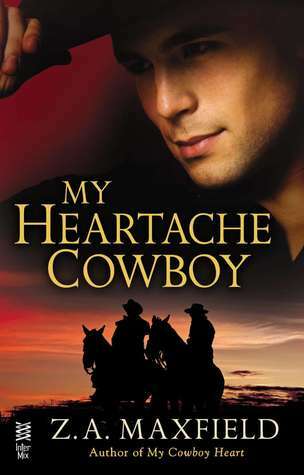 So if you’re looking for a good ride with a few exciting bumps thrown in, saddle up and grab a copy of My Heartache Cowboy. You won’t be disappointed!